The game is commented but one of the moves does not make much sense to me. However, they ARE 9p so I'm probably missing something but it seems very obvious to me that there was a better move. 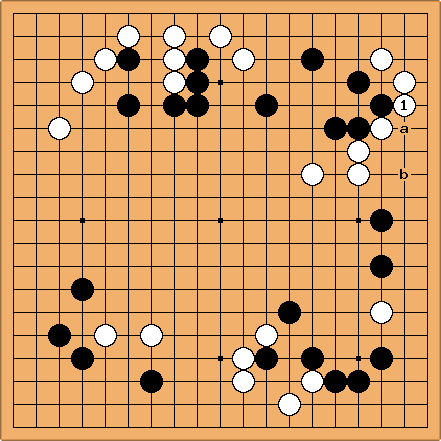 At white move #48, he choses to play s15 which results in his group being cut. Couldn't white simply play s14 which connects his groups? Why does he not do this? I see no advantage to allowing the cut. Intuitively I would say that while W will get cut, he will build strength against the B group at the bottom, while a would leave a weakness at b, perhaps? It would seem to be a nice result for B, even if white ends up safe. Seems it could get pretty complicated (I haven't looked further in the game).